One of the most powerful backup software for windows, 1Click Backup Software, has become extensively popular in recent times. It has the capabilities of backing up all personal files, folders and other important documents. It also has the capabilities of backing up information from other external memory storage. The most significant features of this particular software is its ability to backup files in compressed form, thereby facilitating the required security and integrity of information and data. 1Click Backup Software offers online data backup on any remote server from any existing storage devices or from any external memory storage device. This particular software gives a user a memory of 100 MB free space on any company server. Once the software is completely installed, the software when accessed displays the interface with four options of BACKUP NOW, RESTORE BACKUP, ARCHIVES, CUSTOMIZE and SCHEDULE TASK. Once the user selects the option of, BACKUP NOW, he is presented with two options, Backup Now and Customize Backup. 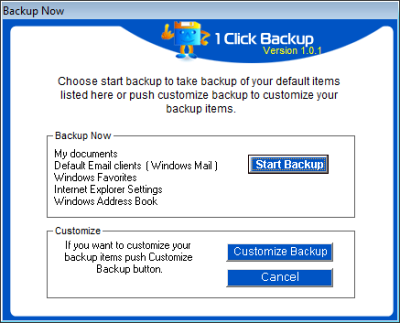 The backup option provides you with the quick backup mode or the user can also use the option of Customize Backup to take back up of files of the choice of the user. Both the options are available until the user save any particular mode as default. Once the user save any back up as default then the application will only use the Backup Now option. In such scenarios, the user can use the Customize Backup option provided on the user interface. Restore Backup option gives the user to restore files and folders in three easy and simple steps. In the Restore Backup option, the user need to click on the Select job file option to browse through his computer to choose the particular file he wants to restore file and then needs to give the backup name and description and follow the instruction wizard to guide him for the entire restoration of the backup. If a user selects the Archive option, he can archive the backup tasks. The option displays the list of backups that a user can select and run directly thus facilitating the backups quickly through user friendly and easily comprehendible steps. With the Customize option the user can personalize various applications to take back of files and folders of his own choice. A user can create own backup task, select files of his choice and customize backup location. 1Click Backup Software also offers the unique feature of defining and setting up of scheduled tasks and applications to take backup of a particular archive. In the “Schedule Task” option, the interface presents with two tabs, Create New and Delete Existing. With the Create New option, the user can select archive he wants to run. Delete Existing option offers the user with the option of deleting a particular task which he may not require any more. 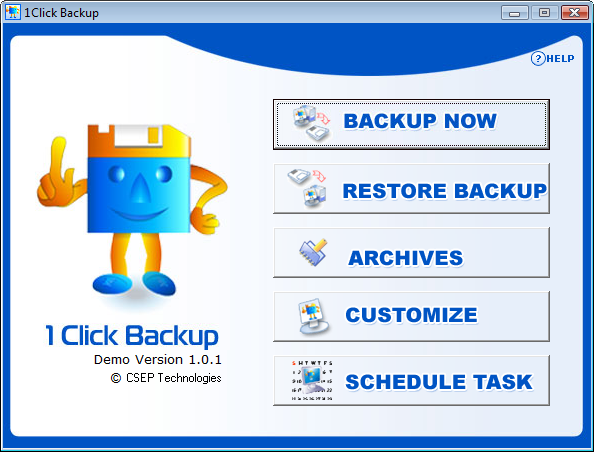 With its easy and user friendly interface, 1Click Backup Software (www.1clickbackup.com) offers efficient single-click backup application. It is one of the finest and most efficient backup utilities available in the market.